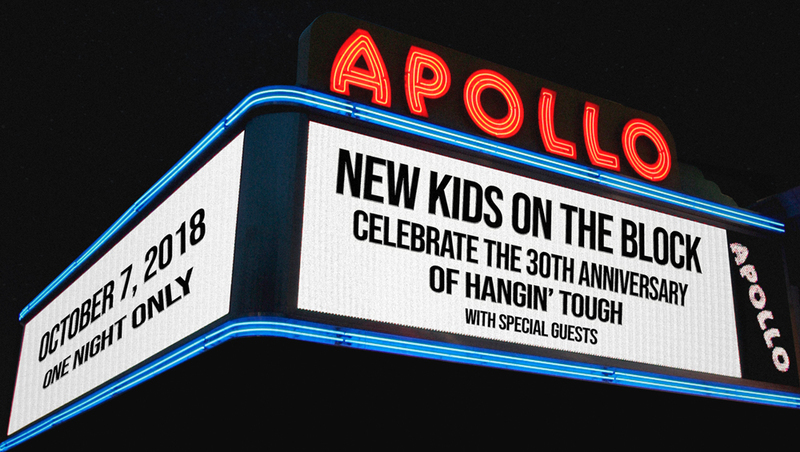 We are proud to announce a special concert, commemorating the 30th anniversary of our Hangin' Tough album release. The show will take place on October 7th at New York City's legendary Apollo Theater, a stage that helped kick-start this amazing ride we've been on! Thanks for joining us on this journey of a lifetime; your support has enriched our lives with so many unforgettable memories. Let's celebrate together on this incredible one-of-a-kind evening. This is gonna be an evening that’s for sure not to be missed! * Beginning on August 16 @ 10am ET, log in and go to the EVENTS page where you will find your unqiue presale code (top of page) and the GET TICKETS link for the 10/7 Apollo show. * REMINDER! Your new login credentials are: email address + your current password. CLICK HERE if you need to reset your password. * Due to the limited capacity of the venue, VIP Packages will not be available for this show. * Members may purchase up to 4 tickets with a member presale code. If you are not yet a Block Nation member, sign up now!